Transylvania - that Hungarian/Romanian region of high mountains, mist-shrouded forests and ruined castles all too frequently associated with Count Dracula - may one day, if the world proves just, be even better known for another, less fictionally embellished Count: Miklós Bánffy, the author of Erdélyi Történet - The Transylvania Trilogy, also known as The Writing on the Wall. These three volumes - They Were Counted, They Were Found Wanting, and They Were Divided – offer one of those increasingly rare experiences in a reader’s life: the opportunity to encounter a true masterpiece of 20th century literature still largely unfamiliar to much of the literary world. With a sense of respectful awe and that curiously pleasurable melancholy with which one comes to the end of a greatly affecting, singular work, I’ve just finished the trilogy, which for me also offered the even more rare and private experience of finding a work so resonant as to enter a select personal literary pantheon: those books through which I feel (egotistically, yet irrepressibly) that the author seems to be speaking to me personally, and towards which I involuntarily adopt a strangely fierce, almost proprietary defensiveness. I found The Writing on the Wall to be an enthralling, compelling work, providing the same liberating sense of being opened by a work of literature as I experienced in finishing, for example, Dostoyevsky’s Crime and Punishment or Stendhal’s The Charterhouse of Parma, or more germanely, two other works in the pantheon, Guiseppe di Lampedusa’s The Leopard and Thomas Mann’s Buddenbrooks, that movingly depict, with intimate and sure authority, the decline of nobility in a changing world. I realize that this kind of wantonly promiscuous praise is liable to invite accusations of indiscriminately making an all too hasty rush towards the wildest and most irresponsible of claims. But in the case of Bánffy I’m willing to take that risk. This is literature on a grand scale - as engaging, stimulating and enjoyable as anything I’ve read, yet unusual enough for me to feel curiously protective of it. The Writing on the Wall provides pleasures and illuminations in abundance: sensitive and deep psychological insight; engagement with grand existential and moral questions; glimpses into unfamiliar cultures and landscapes; rapturous depictions of the natural world; history on both a grand scale and in the smaller structures of everyday life; an energetic, daring and contemplative curiosity that ranges into the smallest corners of experience; and assured and confident story-telling, sharply intelligent, limpid and lucid, slyly humorous, romantic without being sentimental, generously humanistic without being pedantic, omniscient yet invitingly intimate. The action spans the ten years leading up to the beginning of World War I and the dissolution of the Austro-Hungarian empire, principally oscillating between the Transylvanian city of Koloszvar (today’s Romanian city of Cluj Napoca) and Budapest, with side excursions to other cities and towns of Hungary and to Vienna, Venice, the Swiss Alps, and into the wild mountain ranges of Transylvania. With exceptional clarity and a seamless narrative structure, Bánffy depicts in great detail the intertwining lives of Transylvania’s leading families amid their manor houses and estates, their clubs and apartments in the capital, and their forest holdings in the mountains. His view of the culture of Transylvania’s nobility at the beginning of the 20th century is both a panoramic and penetrating portrait of this unusual region, set apart like an island from the rest of Hungary, crisscrossed by mountain wildernesses, stark plains and primitive forests, populated by the Magyar descendents of Tartars and Mongols, by Romanians and gypsies and Jews, situated at the crossroads of European history between the Ottoman empire and the Balkans to the east and south, Russia to the north and Germany to the west; between the aspiration for autonomy versus an uneasy dependence upon the Dual Monarchy ruled by Vienna; and between centuries of tradition and the exigencies of a changing, modern world. The story - as encompassing, as a work concerned with the fate of a nation, as any I can think of - primarily focuses on the young legislator Count Balint Abady (modeled after Bánffy himself, apparently), his growing political sensibility and concern over Transylvania’s fate, his reformist efforts to establish forestry cooperatives to aid oppressed minorities in the mountains, and the chaotic arc of the grande passion he feels for the Countess Adrienne Miloth. Alternate chapters trace the struggles of Laszlo Gyeroffy, Abady’s talented but dissolute, tragic cousin. On a larger scale, the characters in The Writing on the Wall – its title and those of the individual volumes taken from the admonitory tale of the feast of Belshazzar in the Book of Daniel – are pulled along, often in a state of denial, by the tumultuous political events hurtling Hungary towards the First World War. 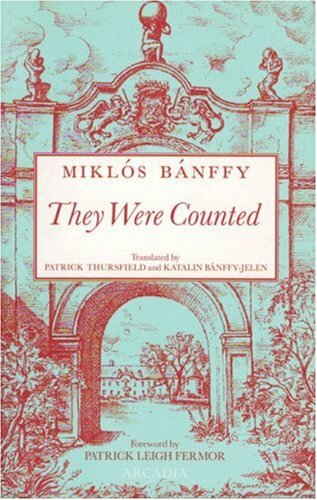 Bánffy is particularly good at not allowing the reader to lose track of his extensive cast of characters; many of the key ones are cleverly presented in the opening pages of the They Were Counted, in which Abady, returning to Transylvania after a long absence, introduces us to them as they pass by him in their carriages along the road towards a grand party at a countryside estate. The world depicted by Bánffy often seems stranded in the 19th century, or at times even earlier, as though feudalism had only just ended. Intensely evocative, atmospheric scenes of finely-dressed nobility idling away at hunting parties, glamorous balls and dinners, escapades in the countryside and nights at the casinos present an idyll of leisure punctuated by dramatic family conflicts, duels and passionate love affairs, political intrigues and nefarious business dealings (awash throughout, it seems, in alcohol and alcoholism). But The Writing on the Wall is unmistakably 20th century: a description of characters adrift in a gondola on the dark surface of the lagoon at Venice, isolated in infinite, blackest night like a vanishing point in a vast nothingness, could almost fit in an existentialist novel. And to pass off The Writing on the Wall as some sort of outstanding period piece, a softly-brushed canvas like something painted by Watteau, would fail to recognize the probing intelligence behind the portrait and neglect the devastating criticisms Bánffy levels at the dissipation and frivolity that helped lead his country towards ruin. As indelible a picture as it is of a fading culture, it’s also a substantive political novel that takes on the key figures of the Austro-Hungarian empire’s decline as well as those ordinary persons who failed to live up to their responsibilities to the country and to one another. While maintaining a compassionate and forgiving understanding of human frailty, Bánffy remonstrates against the idleness; the easy escape into trivial pursuits; the insularity, nationalism, and sloganism; the toxic partisan righteousness; and the indulgence, among leaders and ordinary persons alike, in senseless, age-old hatreds – all those failures to heed the writing on the wall that warned Hungary of its impending splintering and Transylvania of its abandonment. That said, Bánffy hardly comes across as a firebrand; his narrative voice and his central character possess a sagaciousness and equanimity that seem nearly Daoist, especially in the sublime descriptions of Balint Abady’s journeys through the bewitching landscapes of Transylvania and his “sense of wonder and enchantment” at its limitless plains and high mountains, dense forests and lush meadows, where nature serves as a balance and restorative to the harsh vicissitudes of the human world. As well as any writer I’ve encountered, Bánffy richly delves into history great and small. One gets a broad education in the late history of the Austro-Hungarian empire as well as a wealth of revealing historical details (such as the tossed-off observation in the third volume that the Adaby family’s Denestornya castle, well into the first decade of the 20th century, still has neither electricity nor indoor plumbing). At the same time, Bánffy remains acutely conscious of the universal aspects of those forces and conflicts that help to shape history, lending The Writing on the Wall a freshness and contemporary relevance. The insularity, chauvinism, vying for short-term personal gain, blind party loyalty and legislative obstructionism displayed in The Writing on the Wall pose the same threats today as they did in the period Bánffy describes, just as the courage to challenge these forces meets with the same resistance. The novels also offer memorable glimpses into the complex mechanisms of legislative politics and the nuances of political machinations and manipulations. Like his character Balint Abady, Milkós Bánffy served as a legislator in the Hungarian parliament (and even makes a Hitchcock-like cameo appearance among a group of political reformers gathered around Abady in a scene in the third volume). Though the novels’ focus rests squarely on the culture of Transylvanian nobility (presumably it was for this reason that the novel disappeared under long decades of communist rule), Bánffy levels his gaze across class strata, challenging the fortunate to question their responsibilities to the nation at large, its poor, its minority populations, and all those oppressed or abandoned. Some of the most forceful scenes in The Writing on the Wall involve the poorest and most vulnerable members of society: mountain peasants forced into crushing debt and servitude by usurious lawyers and notaries; a young servant, pregnant by her exploitative employer, forced into the streets; a young Jewish girl decimated when a fierce adolescent crush is obliterated by the death of its object; and throughout the novel, one character after another subjected to all manner of impediments to fulfilling their hopes and aspirations. Bánffy treats each with nuanced psychological insight and compassion, extending even to one of the novel’s most despicable characters, whose descent into madness is treated in detail and with a respect for a humanistic view of pathology such as one finds in one of Freud’s remarkable case studies. I know that I am placing a great burden on you when I command you to deal with everything personally. You must realize that our agents, and our tenants, see only what is to their own advantage of what is to yours. I expect more than this from you. The patriarchal relationship that has existed for centuries between the landowner and the people of this village did not end when the serfs were liberated. You must still take the lead, help people, take care of them, especially all those who are not as privileged as you in matters of fortune and education. Think of them as your children, the village people and the people who serve you in the house. You must be severe, but above all you must be just and understanding. This is your duty in life. In large part, the narrative follows Balint and Laszlo’s respective responses to this charge, as well as questions what the charge can mean in the modern world. One reason I found The Writing on the Wall so absorbing is certainly due to the unfamiliarity of the world it depicts. While at times it seems as recognizable as something out of any number of great 19th century novels, more often than not it struck me as so alien as to be as invented and as vastly conceived as August Tappan Wright’s Islandia. Reading the trilogy, I thought repeatedly of Patrick Leigh Fermor’s observation concerning Transylvania in Between the Woods and the Water (the book that indirectly led me to discover Miklós Bánffy in the first place) that the region’s geography seemed to approximate most closely such fictional creations as Ruritania in Anthony Hope’s The Prisoner of Zenda or the fantastical lands one finds in Hergé’s Tintin books. Bánffy’s Transylvania possesses this exotic quality, I think, not only because The Writing on the Wall provides such a broad and deep depiction of a region scarcely known to much of the world beyond its superficial contemporary reputation for ruined castles harboring black-caped vampires, but also because the world he describes has been all but erased, in more than one sense, from the face of the Earth. The culture that Bánffy so painstakingly recreates disappeared into the fire and blood of not one but two world wars. 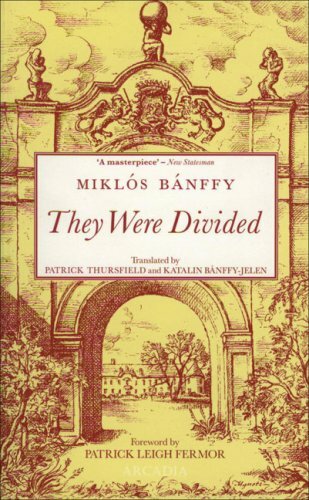 A glance at the completion date noted on the last page of They Were Divided – May, 1940 – is enough to suggest that Bánffy wrote with not only the events leading towards World War I in mind but almost certainly with alarm at the growing warning signs around Europe during the 1930’s. In fact, the Bánffy family castle at Bonţida – the model for Balint Abady’s own Denestornya – would soon enough be almost completely destroyed by the Nazis as retribution for Miklós Bánffy’s efforts to persuade Romania to side with the Allies (readers impressed by the striking descriptions of Denestornya may be pleased to know that the Bánffy castle is currently undergoing restoration). Beyond this, many of the very names of the places Bánffy mentions are gone, elided by shifting borders and languages and by expedient decisions in distant capitals. I envy the reader who can find an excellent map of Transylvania from the early part of the 20th century so that he or she can follow the novel’s action from place to place. Those without a background in Romanian and Hungarian and who hope to do this by turning to a contemporary map will most likely find the task as difficult as I did. I found very little in The Writing on the Wall that grated or struck me as a weakness. While one can argue that the work employs some familiar literary conventions, it is so singular, such a compelling and unusual work, that one can overlook them. Or rather, rarely in my reading have I come across a writer so fully aware of the conventions he employs and so confident in his use of them to tell the story he wishes to tell. Occasionally I found myself wincing at some canard of male chauvinism (for example, at one point the narrator suggests off-handedly that women are destined to have a nursing instinct), but these occur rarely, vastly overshadowed by Bánffy’s deliberate and careful attention to the intimate and public lives of his female characters. Not since Henry James have I encountered a male author of the period who makes such a committed and concentrated effort to explore the inner lives of his female characters. While the love scenes between Balint and Adrienne at times drift towards the romance novel end of the descriptive spectrum, Bánffy somehow always manages to pull them back from the brink. He’s also refreshingly open and free of any trace of Puritanism in his treatment of sexuality, including in a scene in which Balint Abady offers – to God, no less - a convincing defense of adultery. About halfway through reading the first volume of The Writing on the Wall, I realized, with some surprise, that I was enjoying it as much as I’ve enjoyed anything I’ve ever read. I’m happy to say that this sense continued through to the final page of the final volume. I have no hesitation in recommending The Writing on the Wall with the greatest of enthusiasm. While I’m fiercely delighted to welcome its three volumes into my personal pantheon of favored books, I’m also confident that, beyond whatever personal tastes may bias me, it’s a work that richly deserves and will one day receive wide recognition as among the quiet, powerful glories of 20th century literature. 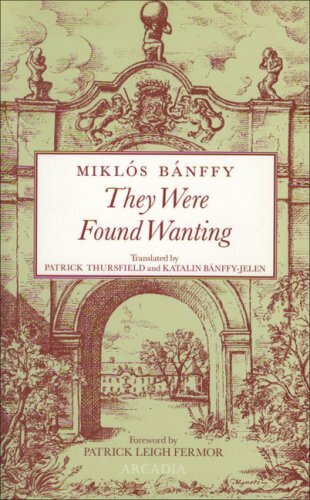 The first (and only) English translation of Bánffy’s trilogy began appearing in 1999; when the third volume came out in 2002, it was awarded the prestigious Oxford-Weidenfeld prize for the translation by the late Patrick Thursfield and by Miklós Bánffy’s granddaughter, Katalin Bánffy-Jelen. The story of the translation itself, presented by Thursfield at the beginning of They Were Counted, makes for fascinating reading. Patrick Leigh Fermor, appropriately enough, has also provided a short preface. To my initial dismay I learned that the books, with the exception of the 2nd volume, are difficult to find and often extraordinarily expensive, and so made use of the good fortune of my access to a first class library and checked them out there. However, I rejoiced at the serendipity of discovering, soon thereafter, that the three volumes are being reissued this very month by Arcadia Books and are already becoming available in the UK. I will be reading this trilogy in February, after I get through Javier Marías's 'Your Face Tomorrow.' Excellent blog. It is sad to come across one old noble house after another either ruined or in a poor state of repair serving as an orphanage or asylum. The landscape is still there but the great variety of people and culture that Banffy, Leigh Fermor and others described have gone. Transylvania is poignant with what has been lost and at what might have been but didn't. The Romanians themselves don't seem to care because much of the wonderful architecture was left by others - Hungarians and Saxons. That said the landscape still draws travellers. It seems that it is foreigners who best appreciate what is good in Transylvania. Many thanks. As you can tell, I was enthralled by the Banffy books (I'm reading his even-harder-to-find memoir, "The Phoenix Land," right now, with almost equal relish). I hope one day to make a trip through Transylvania myself. FYI: The memoir seems to be readily available now. Finally! Hoping this comment goes through. Using a different computer to comment. I want to say thanks for the suggestion on Max's blog for the trilogy. I got a sample on the kindle and will try it. Then decide if I want to read on the kindle or a had copy. Guy - I hope that after reading the sample you're inclined to read the rest. I loved these books, and I'll be eager to see your comments about them. And I'm glad to hear that Arcadia has made a kindle copy available, as even their reprint of a couple of years ago seems to be increasingly difficult to find at a reasonable price. Tremendous review, Scott. I'm going to have to read these novels, aren't I? Seriously, they sound great, they really do - broad in scope yet intimate in detail. This trilogy seems to have everything going for it, and it's such a fascinating period in history. I like what you say about the probing intelligence behind the portrait, too. Perhaps I'll just ditch any other reading plans for the back end of this year and replace them with a Banffy-fest. This series could be just the thing for the long, dark nights of winter. By the way, but have you read any of Antal Szerb's work? Something in your review reminded me of Szerb's Journey by Moonlight - the sense of a vanishing world, I think. I have Journey by Moonlight but have not yet read it. I would not be surprised to find in it a sense of a vanishing world; the more literature I read from the final years of the Austro-Hungarian empire the more it's obvious how tremendously people there felt about the disappearance of the Belle-Epoque. Bánffy writes about so many things, but overarching the entire three volumes, and giving the trilogy its potency, is this enormous tragic sense of a world lost forever.